Goodies by the Pound: Apple Caramel Crunch Pie! Premium quality baked goodies handmade from scratch. Welcome to my blog, I hope you like all of the goodies that I post here! To place an order, just e-mail me at Goodiesbypound@aol.com! 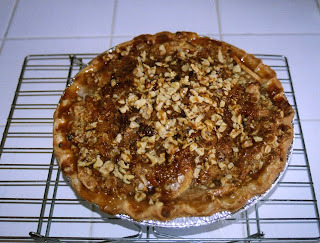 My decadent Apple Caramel Crunch Pie is perfect for your Thanksgiving! Why should you worry about making pie crust, peeling apples, or baking the perfect pie when you could have me deliver one right to your door all ready for you to eat? But why stop at one? After you eat all of this pie, you're going to want a second! Find out why this pie gets rave reviews from everyone who has tried it and order yours today! I've been baking since I was little and worked in the restaurant industry for years. I love to cook and try new recipes. I am on my own now, baking delicious cupcakes, pies, muffins, cookies, and other treats to order. I also make hand decorated chocolates. Great for showers, birthday parties, holidays, or just because you want something yummy! Peanut Brittle for the Holidays!